Time flies! Wayne & I took an awesome motorcycle trip Monday. We were gone all day ~ it was so much fun and exactly what we both needed after all the house guests were back home. 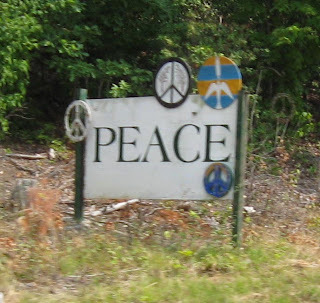 We went through this awesome little town of "Saluta", where we were greeted by this wonderful "Peace Sign", had lunch and walked around the little town. We found this great little vintage shop that was just so much fun and chocker block full of funny stuff! Yes, the sign was quite awesome! I felt like I had a "personal welcome". Thanks, Katie!!! awe woman, I'm so glad you all had this adventure!!! How cool...I just remember sitting with you all talking about "When Wayne retires we'll..." and you ARE! I just love what an inspiration the two ofyou are. At least to me personally. :) and OMG - I totally love those old antique stores that just have weird stuff in em. I mean...where else do you find Manequins clothed in lime green with a stuffed Raccoon?